health services provided to ensure better health for all. also welcome as long as they relate to public health issues. the Theme: Wellness – Nutrition in Fiji”. Submissions are due May15th 2015.
or the Health Research Portal @ www.health.gov.fj/fijihrp. 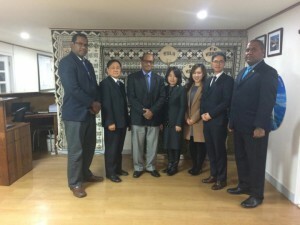 Hon Jone Usamate with the Sunny Korea Welfare Foundation senior officials after their meeting at the Fijian Embassy Office in Seoul. The Minister of Health and Medical Services, Hon. Jone Usamate rounded off a successful tour to India with discussions for a fully funded program training program for our doctors in the Republic of Korea. The Hon Minister met with the senior officials of the Sunny Korea Welfare Foundation at the Fijian Embassy Office in Seoul with the Fiji delegates returning home via Korea after their 11 days tour of India from the 28th of February to the 10th of March. Sunny Korea Welfare Foundation is a charity organization in South Korea founded by Mr. Yujin Kreves who has helped many children in Asian countries with heart diseases to live a quality life. The Sunny Korea Welfare Foundation have proposed to the Minister; a fully sponsored trip for two to three Fijians doctors to be trained in medical institutions in the area of heart disease prevention, heart disease diagnosis and heart surgery. Sunny Korea Welfare Foundation has also offered a proposal for a medical camp in Fiji and surgery intervention in South Korea for Fijian children who have congenital heart diseases. Hon. Usamate responded that the generous offer from Sunny Korea Welfare Foundation has brought rays of sun to the Fijian medical fraternity by increasing their skills and knowledge on heart diseases and especially to our children who are suffering from congenital heart diseases. He said he will see to it that this proposal with the Sunny Korea Welfare Foundation will come to fruition when he returns home. 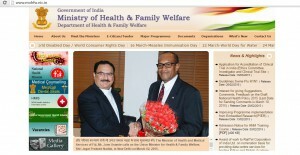 The Minister of Health and Medical Services, Honorable Mr Jone Usamate, met his Indian Government counterpart, Honorable Shri Jagat Prakash Nadda – Minister of Health and Family Welfare in Delhi this week to lead discussions in health sector as a follow-up on the bi-lateral matters discussed during Prime Minister Modi’s visit to Fiji in November last year. The Hon. Minister Nadda, with his high-ranking officials of the Ministry, warmly welcomed Minster Usamate and the High Commissioner and stated that his Ministry was keen to support Fiji on the priority areas of need in medical care. Minister Usamate in his opening comments expressed his appreciation to the Minister and the Government of India for the support India had provided to Fiji over the years. He further said that Fiji and India had a historical 135-year relation and looked forward to seek assistance from India’s world-class medical expertise. He provided an overview on the extension work done to the infrastructure at the CWM Hospital where additional operating theaters were built. He further explained that the extension and new technologies enabled various types of heart surgeries associated with cardiovascular diseases and other complex surgeries accomplish in Fiji. Minister Usamate also thanked the Indian Government for assistance given by the Government of India in the past, such as ambulances, boilers, and medical equipment. He further said that the meeting was an important one as both ministers needed to renew the objectives of the Memorandum of Agreement that was signed between the two countries. He further said that Fiji would be hosting the Second Joint Working Group Meeting in the first half of the year with India’s Ministry of Health and family Welfare. The landmark meeting between the two Ministers had many important agendas discussed including establishing an institutional collaboration with India’s Premium medical Institution – All India Institute of Medical Science (AIIMS). The delegates from Fiji included, the High Commissioner of Fiji to India, Mr Yogesh Karan, Chief Pharmacist, Mr Apolosi Vosanibola, First Secretary Mr. Sakeasi Waikere, and the Second Secretary Mr. Om Prakash. Moreover, Hon. 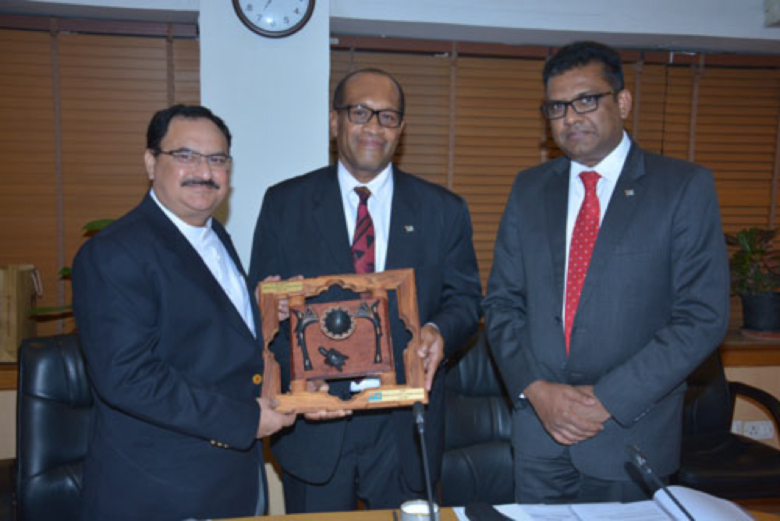 Usamate briefed Minister Nadda on Fiji’s keen interest in Traditional Medicine and the Indian Systems of Medicine and Homoeopathy (ISM&H) stating that he will be initiating discussions from his Ministry through Fiji’s Mission in New Delhi. Fiji’s High Commissioner to India, Yogesh Karan, said that Fiji’s request for a quota-system every year where Fijian students could study medicine in top Indian medical universities on self-funding basis was also discussed at the meeting. He added that Hon. Usamate requested to the Government of India if Fiji could be given an allocation for 3-5 seats initially for undergraduate and specialized medical studies at postgraduate level. Karan further stated that follow-up discussion would be held with Ministry of External Affairs and the Ministry of Health in India in the forthcoming weeks. The Hon. Minister Nadda expressed his Ministry’s willingness to assist Fiji and assured Hon Usamate that his ministry would hold discussions with Ministry of External Affairs on Fiji’s requests once his office receives detailed proposal from Suva. Minister Usamate later met with the Drugs Controller General of India, Dr G.N. Singh to established collaboration on drug pharmacopeia standards being used in India and other technical support that Fiji could benefit from the world largest supplier of the finished generic medicine products. 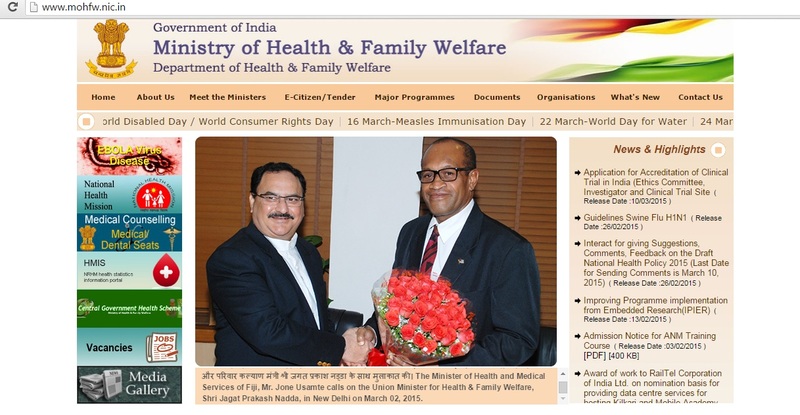 L-R: Minister for Health and Medical Services of Fiji Honorable Mr. Jone Usamate, Minister for Health and Family Welfare of Government of India Honorable Shri Jagat Prakash Nadda and Fiji’s High Commissioner to India Yogesh Karan at Nirman Bhawan Complex, New Delhi.